largest privately owned sailing yacht in the world. The founder of MDM Bank (pictured above with his supermodel wife) who ranked 97th in the Forbes World's billionaires list, hired master ship designer Philippe Starck, whose credentials include Steve Jobs' famous yacht and Mr Melnichenko's first opulent vessel. 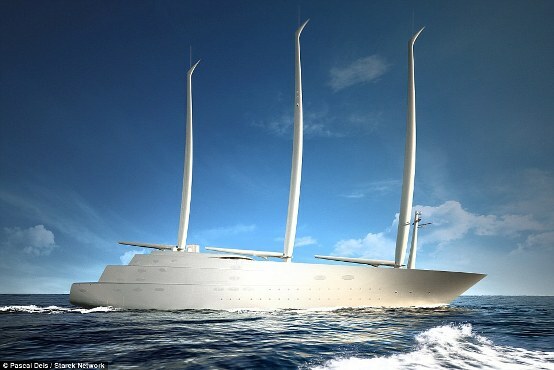 The yacht, which Mr Melnichenko is thought to have named 'A' to ensure it is listed first in shipping registers, is due to begin its first sea trials later this year. Initially it will be tested with one mast before the others are fixed in place. With an 26ft (8 metres) keel and width of around 81 feet (24.88 metres), Sailing Yacht A had to be built in one of the largest shipyards in the world in Nobiskrug in Germany.